Although his friends forgive him by the end of this episode and there are smiles once more, the fact that Barry made an epic blunder is not erased (unlike that previous timeline! Ho ho!) and Barry owns the guilt. The Flash owns the guilt for him. While it’s frustrating that so much has changed with this new universe, I can’t help respecting the show for how much it’s refusing to let up on its hero. For the most part, there are no excuses for what Barry did coming out of the characters’ mouths. No one on screen is trying to convince us that Barry’s actions were okay or reasonable — just really, really stupid and emotional and desperate. I just hope that the show keeps it up. No more playing with time travel, The Flash! Pick a timeline and stick with it! We open with Barry speed-talking his way through an explanation of The Big Mistake, then it’s revealed that he’s talking to Felicity Smoak. Hi, Felicity! Felicity is the only one in the episode who really tries making Barry feel better about his idiocy, and I’ll forgive her for it because she’s a glorious sunflower in human form and can’t help herself. Because we all know that Barry does not need to feel better about ruining the universe, right? Don’t trust his puppy eyes, people. He may look adorable, but he has magnificent powers and wields them poorly and being cute doesn’t give you carte blanche over who lives and dies. During Barry’s chat with Felicity, we also get a rundown on what’s changed in the new universe: Cisco’s brother Dante got killed by a drunk driver and Cisco’s sad and also angry at Barry for not going back in time and stopping it; Iris and Joe are fighting because this version of Iris resents the fact that Joe never told her that her mother was alive; Barry has a British officemate played by Tom Felton, of Harry Potter fame; and Diggle’s Baby Sara is now Baby John. And, oh yeah — Barry and Iris never had a romantic chat and kiss on the porch. Dangit, Barry! Stop erasing romantic Westallen moments! On top of dealing with the timeline changes, Barry has to actually, you know, live his life. Which means going to bizarre crime scenes with Draco Malfoy the Snarky CSI and asking questions to which Barry should already know the answers, making me wonder how Barry isn’t immediately hauled in for a brain scan. If I got to work one day and started asking basic questions about my job like a sly amnesiac, my co-workers would probably do more than just look at me funny. Even if “time travel” isn’t at the top of the list of conclusions for everyone around Barry to draw, they are acting super blase about his inability to comprehend anything in his life. They should at least be asking if he hit his head recently or something. Barry Allen Timeline Hijinks ensue and, after his plan to get everyone back on speaking terms with each other through a family dinner bombs big time, Barry eventually realizes that things are not going to be smoothed over with Grandma Esther’s Noodle Dish. The arrival of The Rival from the previous timeline makes things much, much worse, and Iris confronts Barry over his sketchy behavior. All the complications compound on each other, until finally Barry sees only one possible solution: more time travel! Because it’s worked so well in the past, right? For a hysterical moment I think that The Flash is going to do another universe wipe, that every episode this season is just going to be universe after universe ruined by Barry Allen. 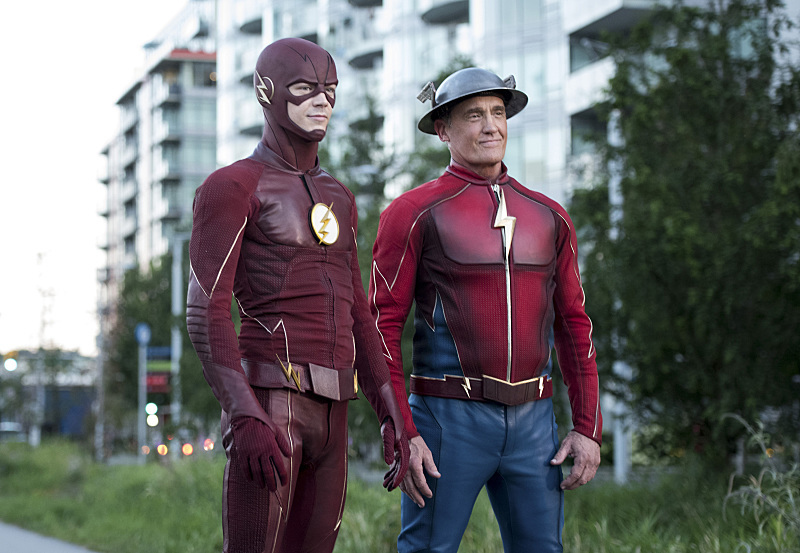 Blessedly, Earth-2 Jay Garrick shows up before Barry can enact Flashpoint Part 3, in which everyone is probably dead or dying and King Shark is President of the United States. I’m not sure how Jay timed that Barry interference so perfectly, but whatever. Jay breaks a coffee mug (I hope he paid for that) to illustrate how Barry done broke the universe and Barry rolls his eyes at him because he already knows time travel can be bad. Hey, Barry, if you know enough about the negatives of time travel to sass Jay, maybe you shouldn’t have freaking done the time traveling. 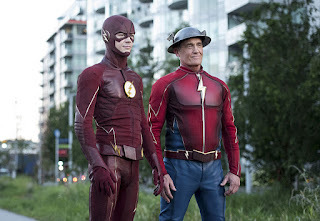 Jay Garrick’s advice to Barry boils down to this: Just deal. Move forward. There is no “fixing” the mistake that Barry has made, and he’s going to have to live with the consequences. More than that, he’s going to have to live with his friends living with the consequences. Cisco’s brother can’t be un-killed by that drunk driver, Iris and Joe are going to have to work hard at repairing their relationship, and I suppose Baby Sara is just gone forever. Barry has to live with the knowledge of the previous timeline and the effects of the current one, and he’s going to have to live with the fact that everyone knows he’s responsible for certain things… but, since they specifically request that Barry keeps the changes to himself, I bet curiosity eating away at them all, too. I kinda wonder how that’s going to play out later in the season. Question: Why exactly is the Flashpoint effect not happening to Barry in this new universe? Shouldn’t his memories of the previous timelines start fading away? Furthermore, what happened to the memories that did fade away during “Flashpoint”? Did he remember them again, or is he dealing with blank spots? Add in the fact that Reverse Flash/Eobard Thawne never seemed to have any memory troubles (though, for some reason, he understood exactly what was happening to Barry immediately) and I find myself questioning the logic behind this whole idea. Basically, the Flashpoint memory-wipe effect makes no sense and was only there because, one: it was an element in the comic books, and two: it made Barry going back to re-murder his mom more critical. Barry returns to share the sad, sad news that he’s done messing with time and he’s really sorry about it, but he’s going to concentrate on fighting The Rival and The Rival’s creepy new pal, Alchemy. Barry nearly dies in the fight and everyone bands together to save him, but the real hero is Cisco because Cisco’s Vibe powers in this universe have been taken up a couple notches. Cisco and Barry seem to patch things up a bit, though they’re still a little shaky, and I think it’s important to note that it isn’t so much that Barry is forgiven for what he’s done, but that his friends love him more than they dislike his actions. Which is understandable and acceptable. The Alchemy character, by the way, appears to be capable of restoring metahuman powers to people who had them in previous universes. Not really sure how that works (does it only happen when Barry changes stuff? Is it just the Earth-1 timelines? What about the timeline that changed when Eobard went back and killed Barry’s mom?) but we’ve already covered how thinking too hard about the science of this show might give a person a headache. So let’s just leave it for now and keep our fingers crossed that Alchemy doesn’t turn out to be Evil Speedster #4,985. I love Felicity and Barry interactions and need like 500% more of them in my life. “Okay, you know what? I don’t want to know any more!” Grant Gustin’s delivery of that line was perfection. It’s adorable that Wally is the first to agree to Barry’s dumb plan of a Team Flash retreat. Grant Gustin’s really good at acting and I love him. I really love that Iris is the one who sticks up for Barry. And that her argument rests on the acceptance that Barry did something terrible, but Barry is still Barry and they love him. That’s the only way any sort of “we should forgive him, at least a little” argument can hold up in this situation. Barry really needs to learn how to lie without looking so shifty. The dude has a secret identity, for heaven’s sake. Cisco still calls Wells "Harry"! This is no longer the Darkest Timeline. Oh yeah, and Caitlin has Killer Frost powers in this universe. Iris and Barry’s scene on the porch at the end was A+. I appreciate that the show is pushing Barry hard on this. If humans had the ability to change the past, I know we would abuse it, even good people, especially when said people are in great pain. I think that Barry's ability to change the past had to be pushed to the limit. It will make future painful decisions not to mess with time deeply understood by the whole team, especially Barry. There will come a time when it will be very tempting to do so again and everyone will be on the same page. Barry needed hard consequences and he needs to feel awful about them. He needs to see and deal with the fact that we are not the only ones who suffer because of our decisions. Everyone else has to live with the consequences too. That's life, superpowers or no superpowers. I like that the show made it clear that forgiveness does not mean saying "It's okay." Forgiveness is letting go and and moving forward, extending compassion even though people don't "deserve" it, being willing to love and trust again even though you've been badly hurt. It's tremendously courageous and difficult and I like when shows bring their characters through things that are courageous and difficult. Bad decisions remain bad decisions but there is a way forward. Otherwise, we are all screwed. It will be interesting to see how the Arrow tv show incorporates Diggle's son (and absence of baby Sarah) into their storyline. Loved your review!